Local bands (in my area) have always piqued my interest, but each time I check them out, I am habitually underwhelmed, although I have found a few gems. Believe it or not, I ran into Phantom Witch on eBay back in 2008 and decided to give them a try based solely on their name. 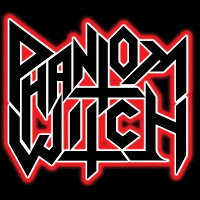 Simply titled Phantom Witch, their sole EP has a no frills, plain Jane cover slathered with their logo. Because of that, I have little idea why I picked the band aside from the fact that they were described as thrash metal for fans of the old school. For the first review I ever wrote on Metal Archives, I ended up choosing this very EP, giving it an 84%. It really is quite good considering it sounds like a "polished" demo and given the status of the band as newbies. Overall, I was pretty satisfied for the price I paid ($5 or something like that). Actually--I still am despite the it having little staying power with me. It's not something I can listen to on a whim, but rather when I'm in the mood (Cue Rush - "In the Mood."). Musically, the guitar riffs are fairly original and well-thought out with obvious black metal influence. The solos are pretty maniacal, too, but they're messy and have little thought to placement. Drumming and bass playing aren't particularly spectacular, but they get the job done, while vocals are characterized by a gruff, tough guy sound. For a demo-like EP, everyone's playing sounds pretty tight. Phantom Witch had me looking forward to great things. Every once in a while, I would check up on their status, only to be met with few signs of life and, eventually, they broke up without a word. Disappointing to the say the least, but I'm not heartbroken because the band weren't exactly groundbreaking, but it was fantastic to have them around locally. Alas, sometimes things are too good to be true. The songs on the EP don't stray far from each other and sound similar, but they're all decent. You should get a feel for what to expect from the song I'm posting.